Cats are complex creatures. They are full of personality and quirks that make every one of them unique. That’s why we love our cats so much! There are no cats out there that are exactly like our own. These unique quirks and bold personalities make each cat irreplaceable. But sometimes, we can’t help but wonder if our cats feel the same about us? Just like us, cats have unique ways of communicating with each other and their humans. Watch out for these subtle signs of affection next time you interact with feline friends. Although not all cats are vocal, they do communicate with their eyes. They use their eyes to express emotion and affection. One of the ways cats show you they love you is by giving you a slow blink. Slow-blinks indicate trust and comfort. If you feel the same way, the best way to reciprocate this feeling is by giving them a slow-blink back. The slow-blink is also a way to introduce yourself to a new feline friend, letting them know you mean no harm. Since cats can’t talk, most of their communication comes from body language. Other than their eyes, the next most expressive body part is their tail. 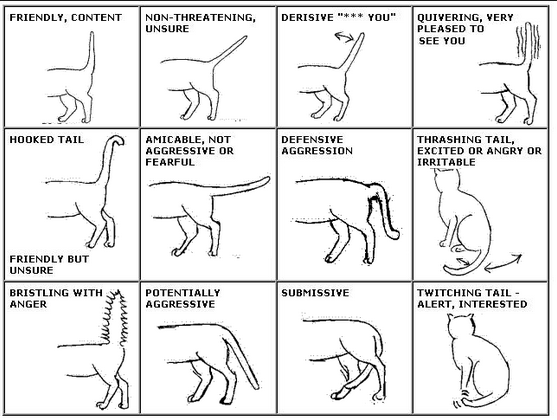 This wonderful infographic from Life with Cats will help you decipher the secret code of cats. Cats express friendliness with their tail straight up. If there’s a little hook at the tip of the tail as well, then they’re indicating friendliness with a bit of caution. However, if your cat greets you with their tail straight up, then they’re especially happy to see you! Kittens knead their mother’s stomach for milk production. As they grow up, they continue to associate kneading with nurture and comfort. When cats knead your lap or body, they’re letting you know they feel safe with you. Unfortunately, cats tend to forget that their claws are much sharper than when they were kittens. So if you’re around “kneady” cats, thicker clothing will prevent you from feeling the painful side of love. The belly is the most vulnerable spot for cats, so they only expose their bellies to people they completely trust. Though, this is not a sign indicating they want you to pet their bellies. It is still a very vulnerable area, so touching their bellies can give them a sense of stress or threat. Instead, try giving them a pet on their head or back. They’ll love the attention! A gentle head bunt is the most affectionate thing cats do to those they love. By rubbing their scent on you, they’re marking you as their friend. It’s a formal way of bonding for cats. Cats have sweat glands that throughout their bodies that allow them to rub their scents on familiar places to “mark their territory.” When cats give you a gentle head bunt, they’re giving you a membership to their club. Cats are finicky creatures especially with the type of people they want to befriend. If you’ve ever received any of these signs of affections from a feline friend, then congrats! They’ve chosen you to be a part of their club. But if you haven’t experienced any of these, don’t fret. No two cats are exactly alike which means no two cats show affection the same way. Also, patience and love is key to bond with cats. Once they learn how much you love them, they’ll come around to loving you back!